As you may know, we are introducing a new feature in Beta 3 which produces a combat.log file while playing the game. The intent of this file is to provide additional concrete information to the community so that players who are so inclined can use this information to help improve their gameplay. For example, it’s my assumption that at some point a DPS meter is going to be made that uses this data to compare DPS between play sessions and classes. However, as I’m sure anyone who’s spent time in other MMO communities is aware, these types of tools can be used for good, and they can also be used for bad in the form of harassment of other players. As such, in addition to rolling out this data we are also introducing community guidelines for its use which will be part of our Code of Conduct and enforced by our moderation staff. DPS meters and any other tools to track player/character stats like the Armory are 3rd party tools and not an official part of the game. 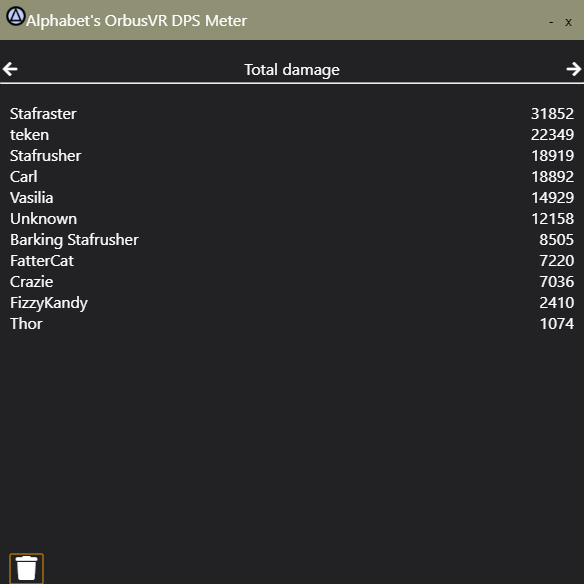 As such they will not be officially supported by the OrbusVR staff and any questions or errors that arise from them should be addressed with the tool’s creator. Keep in mind as these tools are developed that any modification to the game client itself is strictly against the Terms of Service; violating this will result in a ban of your account. While we welcome players who want to use tools such as DPS meters to improve their own play, we will not tolerate harassment of other players in-game regarding their performance as measured by such tools. Basically, these tools should be used for self-improvement, not gatekeeping and insults. As with all aspects of the OrbusVR community, we encourage you to offer help to other players while respecting their own desire to play the game in the way that is most fun for them. These guidelines should seem pretty straightforward and common sense, because they align with the way that the Orbus community already functions. It would not be acceptable, for example, to join a dungeon queue and then harass players who aren’t doing enough DPS to satisfy your desire to get through the dungeon quickly. Or to post an in-game LFG post which requires a certain level of DPS score to join the group. If your Fellowship wants to adopt an internal policy regarding the use of DPS meters, that is a decision that should be considered and agreed upon in advance by the entire roster so that everyone has the same expectation of what type of play you are looking for. But when it comes to the “public” areas of the game, such as Public Events, dungeon matchmaking, or LFG posting, consider these types of tools as personal-use only. Finally, in addition to the above which will be our policy going forward into the Beta and beyond, specifically right now please keep in mind that we have not done a balancing pass of the classes since changing the combat and adding new classes. As such it’s very likely that things are highly out of balance right now – so feel free to discuss and compare class DPS as it currently exists, but do so with a very large grain of salt, and with the assumption that large changes will be coming to the classes in terms of combat balance later in the Beta development cycle. I’ve uploaded a sample of a combat log as well so that if you are interested in starting to work on a tool you can see what the format of the data currently looks like. Note that we will likely add additional detail in the future but right now this is what is available in the prototype. can you add timestamps? Can the example logs include healing received, and healing done? Cheers for the log file, can further my DPS meter project substantially and have it done for the beta probably. One tiny request though: could we have timestamps for the events? Shouldn’t be suuper trivial to add, right? Would make calculating DPS much much more easier. Sure, I will add timestamps. The healing received is the last two lines, it’s “negative” damage. when an enemy is engaged and an enemy dies can you add it to the logs also? that can then be matched against kill times from any API you add for dungeon logs. I’m not sure I’ll have much time to do more on this tonight but feel free to make suggestions as you dive into it and I’ll certainly try and keep them in mind for future iterations. is it possible to note which enemy you engage combat with? Likely what I will do is add in some kind of thing so that the combat log appends the entity ID for monsters…so like it would be “Stafrusher(205)” or something. Then you could have an ID for the monsters and also since player names can’t have parentheses, two birds with one stone. Sounds perfect! So far its been working great, except for that Unknown damage source. I reckon its a player you can’t see, as in they are just out of your render distance but you can see their spells/shots/whatnot hitting the monster? Right so Unknown would be like a player that is outside your range of what the server tells you about hitting a monster that is in your range, or vice versa. You’ll likely just want to filter that out. how wide is the range right now… For example… if one player dies in the dungeon whilst another is attacking and goes to run back whilst the rest of the team is attacking, would those logs be picked up for the player running back? If not, is it possible to make the logs completely dungeon wide? I will see if I can add that in a future iteration, sure. The range is the same range that you can see monsters pop in on your screen as you run through the world. I am intentionally not going to give data to the combat log that you can’t see in the client, otherwise it would make it really easy for someone to create a tool that told you about that information in an overlay or something like that. If you see that happening again send me your output log from the launcher, and I’ll take a look at it. The combat logging works the same as the damage numbers that show up on the monster, are you seeing double damage numbers show up too? It’s also possible that there are two different ones you are hitting or something. Kind of hard to tell without it telling us the name of the attack that did the damage. Oh, also the timestamps are generated on the client right now (not the server) so it’s also possible those events are farther apart but you had a lag spike so both events arrived from the server to your client at once. I don’t think that should really affect DPS meter calculations a whole lot since it will average out over a second or something unless you are trying to get really, really precise for some reason. I can see about generating the timestamps on the server instead. 06:50:14:347 [Combat] Stafrage took 3675 damage from Rickness"Basic shot"